The HP PageWide XL 4100 MFP ushers in a new era of affordable, low cost printing without sacrificing on speed or print quality. Built to produce high quality prints at production speeds it is ideal for companies that need to boost productivity and reduce workflow bottlenecks. The machine has virtually no warm up time allowing users to print as soon as the device is switched on and with a print speed of 8 A1s a minute in both monochrome and colour, dealing with peak print demand is no longer a hassle. 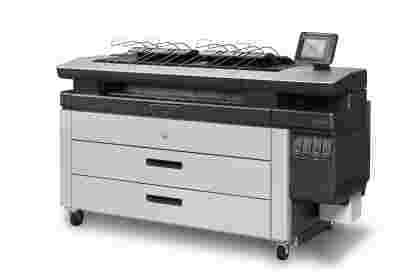 The touchscreen control panel on the HP PageWide XL 4100 MFP takes the hassle out of print management. 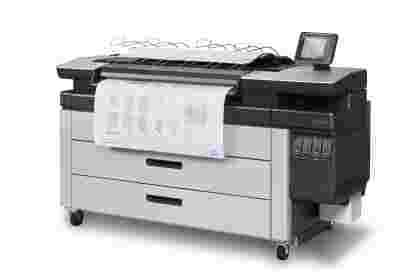 It’s intelligent print controller, powered by an Intel Core i3 processor with 8GB of Ram, automatically selects the desired loaded media, prints without speed reductions in both colour and monochrome and stacks the print ready for collection. The screen provides detailed print and scan previews while helping reduce print/ copy related errors and puts comprehensive scan, copy and print functionality only a few taps away.